Will rooftop solar spell doom for electrical utilities? Fears are running rampant, and San Antonio’s CPS Energy is acting to scale back net metering credits. It’s the utilities vs. rooftop solar, and with PV becoming more accessible and installations soaring, the fight is heating up. 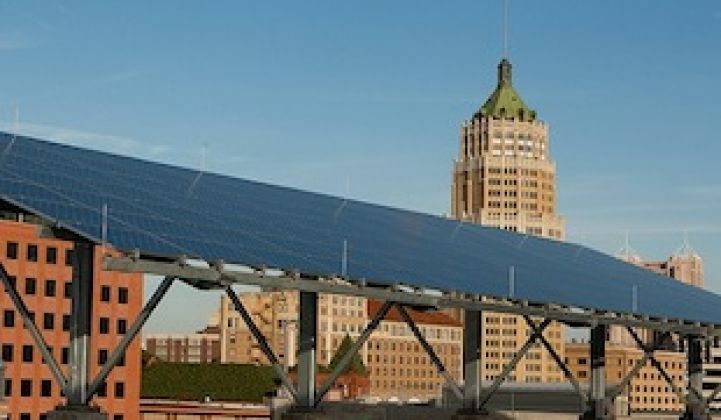 In San Antonio, the municipally owned CPS Energy last week said it will slash the value of the credit for solar produced from rooftop installations. Its claim is a central one made by the utilities: as more people produce their own power through rooftop solar -- and reduce their electricity bills -- utilities are left unable to meet their cost of maintaining the energy infrastructure. CPS Energy said it had two options: reduce the amount it credits solar households for rooftop-produced solar, or raise rates for everyone. Costs to install photovoltaic systems continue to fall, making them increasingly available for more customers. And with that growth, the costs of the utility infrastructure are borne by fewer customers -- those who don’t have solar systems. To ensure that solar customers continue to enjoy the benefits of any distributed energy they produce, and pay a fair share of the infrastructure that they rely on, we’re taking a different approach. This is really important in San Antonio, where one quarter of the community’s residents are at or below the poverty level, and monthly energy bills absorb a larger portion of their monthly budgets. But not everyone is buying that solar is putting such a squeeze on CPS Energy. Lanny Sinkin, executive director of the advocacy group Solar San Antonio, told Texas Public Radio that the utility’s customers don’t have anywhere near enough solar to present a cost-structure issue. “In San Antonio, we have about 8 megawatts of solar distributed in a system that’s more than 7,000 megawatts,” Sinkin said. As it stands today, CPS Energy credits customers at the retail rate for any rooftop solar production. That’s now amounts to 9.9 cents per kilowatt-hour. The utility proposes replacing that with a “SunCredit” of 5.6 cents per kilowatt-hour beginning in November. It says this rate takes into account the cost of poles, wires, substations and the like -- things that all customers, even those who produce more solar than their total power usage, rely upon. Solar advocates have argued that this sort of raw accounting ignores the benefits that distributed solar brings: reduced pollution and expenses for conventional power; less need for new investment in transmission and distribution; reduced transmission losses; and reduced costs of meeting renewable energy standards. The California pro-solar group Vote Solar Initiative earlier this year released a report that called utility cost claims for net metering inflated, and said that once the 5 percent net-metering cap is met in the state, non-solar ratepayers will benefit to the tune of a combined $92.2 million per year. UPDATE: Readers should be sure to check out the comment from CPS Energy rep Lisa Lewis. Her point that the utility offers strong financial incentives for installation of solar, apart from the energy production credit, strikes me as particularly important.